Because giving back is very important. 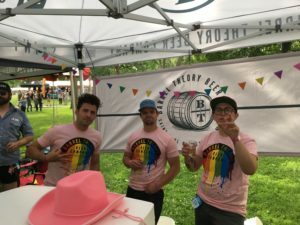 You may remember back in June we participated in Beer Dabbler at Twin Cities Pride and we made super cool Barrel Theory rainbow logo shirts for the event [see photo below]. We sold these shirts for $20 cash and all proceeds went to The Aliveness Project. The Aliveness Project links people living with HIV to resources for leading healthy, self-directed lives. Many of you have asked, begged, pleaded to buy this shirt. The time has come. On Monday, May 7th, Barrel Theory and The Aliveness Project are hosting bingo night at the taproom. Just purchase a ticket (with proceeds going to The Aliveness Project) and you’ll get to play bingo, obtain a super exclusive Barrel Theory Pride shirt variant, and a have chances to win super awesome prizes generously donated by local businesses. Tickets are limited so don’t delay. Also, there will be a special announcement regarding ways you can join us in giving back to the community. It’s an event you won’t want to miss.